Town, Milan, Dubai and Moscow. 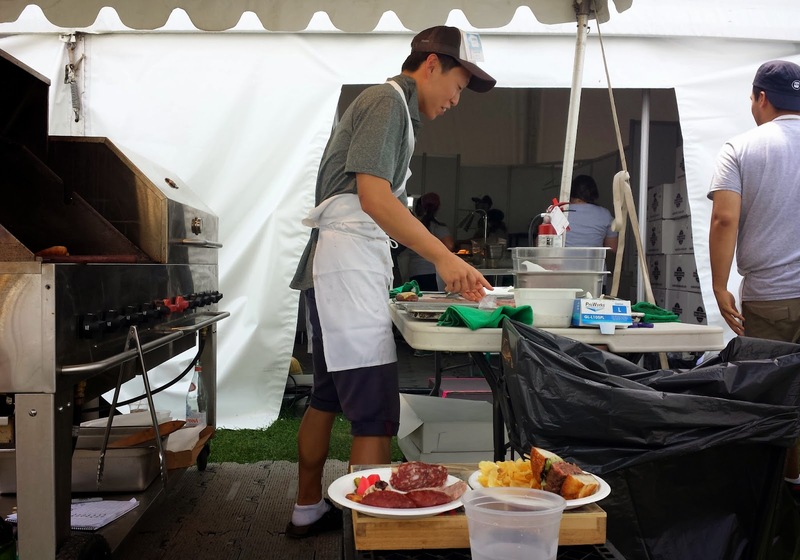 On July 24 - 27, the global outdoor restaurant festival made its first ever North American debut in Toronto. Sponsored by American Express Canada, Taste of Toronto brought together a selection of the city’s greatest and hottest restaurants and top local and international chefs, as well as local artisan exhibitors, live food demonstrations, chef Q&As, interactive cooking classes, expert wine tastings, live music and other entertainment. 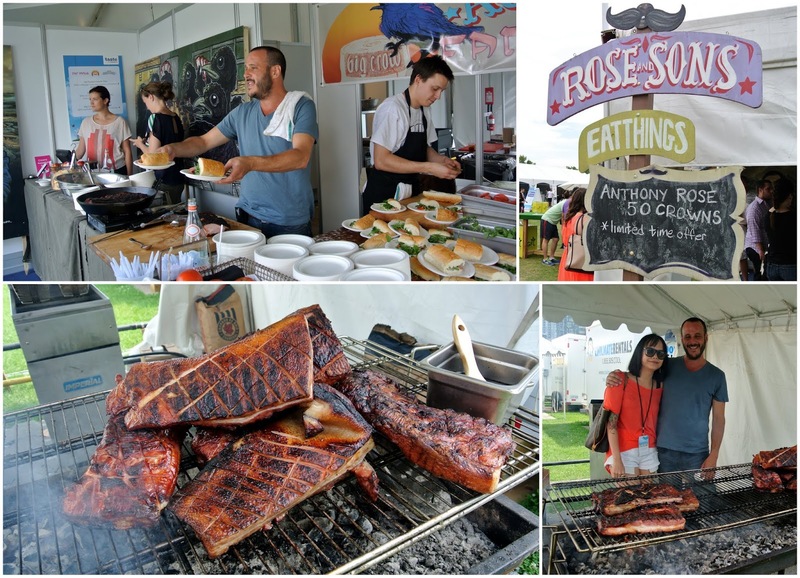 Held at Fort York, the inaugural four-day festival was comprised of six half-day sessions to give guests time to enjoy their pick of restaurant dishes, browse the artisan stalls and enjoy some of the many attractions. Crowns were the official dining currency at Taste of Toronto (i.e. if you wish to purchase a dish from the restaurants or drinks from the bars, a pre-loaded Crown Card was the only accepted method of payment, and 1 Crown = $1). I thought this was a brilliant idea - all the transactions were quick and efficient, and there was no need to fumble for cash or change. 2) The American Express Lounge - I took full advantage of the comfy chairs at the Lounge because I'm not sure if you realize but digesting all that food can be quite exhausting. Besides the comfy chairs the Amex Lounge also offers complimentary water bottles, table snacks, beverage for purchase, as well as special tasting sessions throughout the festival. 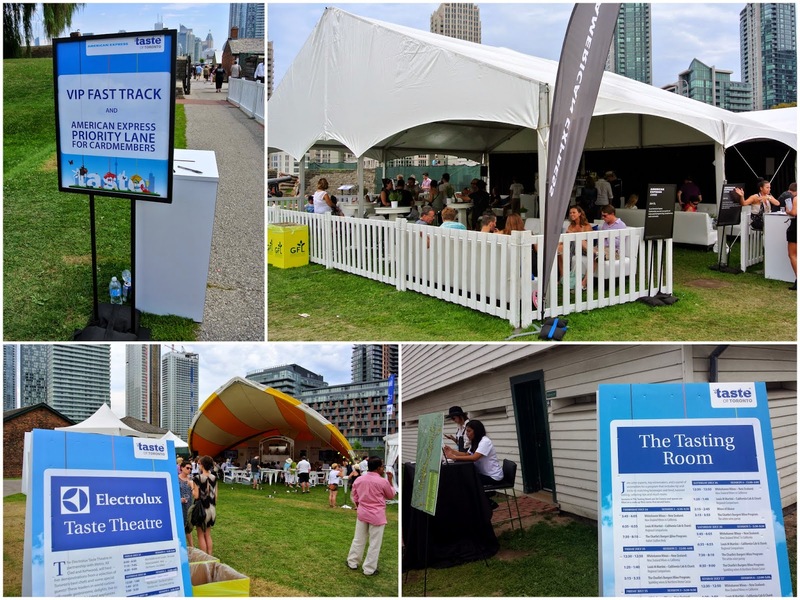 I spent all my time going from one restaurant to another but for individuals interested at feature events held at the Electrolux Taste Theatre, The Tasting Room and Metro Master Classes, know that Amex Cardmembers have access to Reserved Seats at all the above venues. 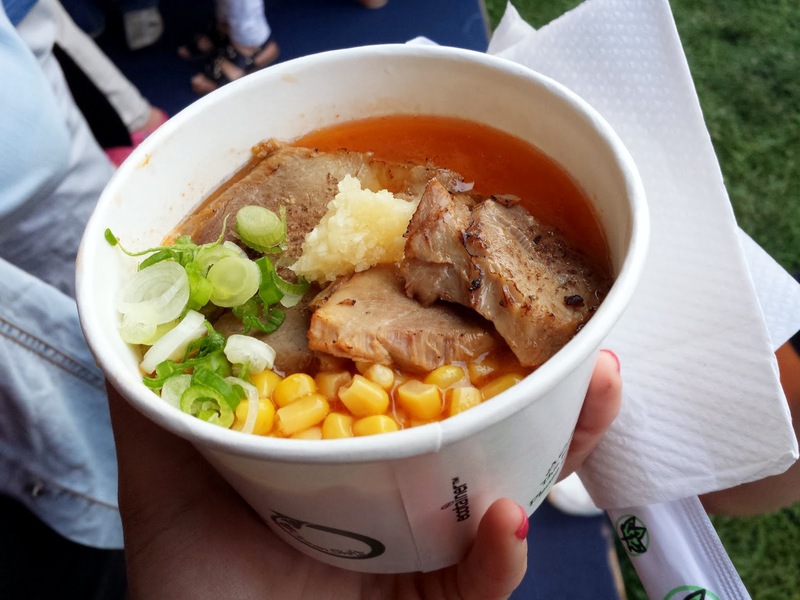 I ate a lot at Taste of Toronto, but how can anyone resist when you have chefs continuously shoving delicious looking food in front of your face? I can't say no. First stop: Guu Izakaya / JaBistro / Kinton Ramen. LOVE these guys so much I needed a picture with them. I even got a kitchen tour. SO MUCH BACON! Oh and take note of this limited time offer: Chef Anthony Rose for 50 crowns! Any takers? Paella for days hours at the Patria / Weslodge / Byblos booth. Oh wait, is that Chuck Hughes?! Sure is! 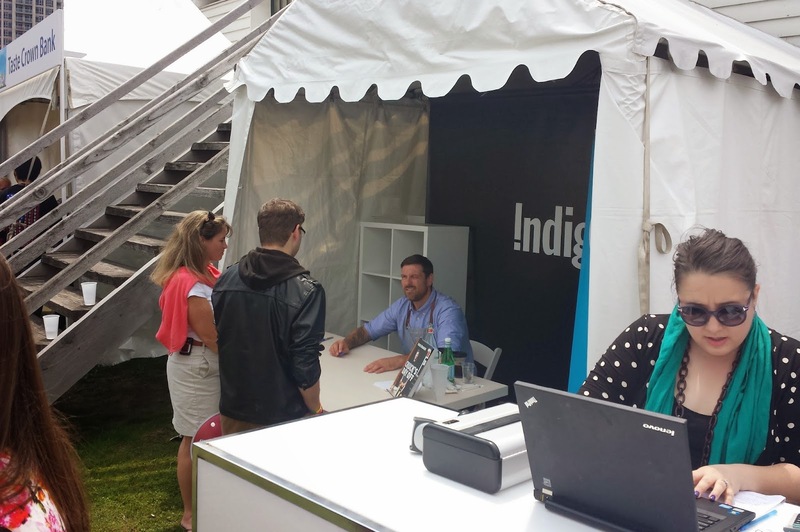 Chef Hughes at the Indigo Book Signing. Baby back ribs (rubbed, smoked, basted, basted....) served with a potato, corn, and candied smoked bacon salad and finished with pickled vegetables. I was asked by several people to pick one favourite dish but it's really difficult to just pick one! Here, I'll give you my Top Ten instead (in no particular order): Rose & Son's BLT, JaBistro's Oshizushi, Hudson Kitchen's Chicken Adobo, Richmond Station's Station Burger and Ice Cream Sundae, Bosk's Coconut Tapioca Pearls, Splendido's Black Truffle Ricotta Agnolotti, Khao San Road's Thai Tea Shake, The Harbord Room / THR & Co's Crab & Prawn Roll and Barque's ribs. Thank you, American Express (@AmexCanada, #DineWithAmex), for bringing Taste to Toronto. I'm already looking forward to Taste of Toronto 2015.